The Pacific Ocean is a remnant of the once great sea that surrounded the super-continent Pangea. As Pangea fragmented, and its fragments began to move away from one another, the Indian and the Atlantic Oceans were created amidst these fragments. While the Pacific is only “a shadow of its former self,” it remains the largest of our present oceans, comprising about a third of the Earth’s surface, roughly 180 million square kilometers (~70 million square miles). The floor of the Pacific Ocean lies an average of 4000 meters deep with the greatest depth of more than 11 kilometers (36,198 feet) in the Mariana Trench. The ocean floor is neither smooth nor a gentle sloping basin. Thousands of seamounts are scattered throughout; some of these extend above the sea’s surface as islands or groups of islands. The floor also contains plateaus, ridges, and trenches. All these features derive from tectonic activity within and at edges of the oceanic plates. The Earth’s crust is comprised of oceanic and continental plates that abut one another with no gaps between them. These plates consist of the lithosphere and upper ductile surface of the mantle; they float on the deeper, more solid portion of the earth’s mantle. The continental plates are thicker (30-70 km) but lighter than the denser oceanic plates (3-7 km thick) and float higher. The plates move because one or more of their edges is a growth zone with a constant upwelling of molten material from the underlying mantle. The upwelling is adding new material to the edges of opposing plates and pushing them apart. Because the molten material is hotter, it is also lighter and rises above the ocean floor creating oceanic ridges or rises. The ridges are divergent zones, as the adjacent plates are slowly growing and moving apart with the addition of new material. At the opposite edge of each plate, it abuts against another plate, the convergent zone. The lighter oceanic plate pushes under the thicker continental plate or, if two oceanic plates collide, both move downward. These convergent zones are also know as subduction zones, and the plate margins move downward into, melt, and return to the mantle. Usually on one side of a subduction zone, volcanic activity and plate uplift occur creating mountain chains on the edge of a continental plate or island archipelagos on an oceanic plate. Islands also arise within oceanic plates where a plume of mantle pushes through the plate and erupts as a volcano on the surface of the plate. These submarine volcanoes commonly persist for centuries. Their periodic lava outflows gradually builds a mound that reaches and rises above the sea’s surface forming an island. These mantle hotspots are relatively stationary within the lower mantle, and as the plate continues to move, the volcano is eventually cut off from the mantle plume and loses its magma source. Soon, geologically speaking, another volcano arises and begins its growth toward the surface of the sea. Weathering of extinct volcano and cooling and subsidence of the adjacent plate slowly erode and drown the island, and it becomes a seamount. The plate’s movement over a hot spot creates a chain of islands. These island chains are linear, and the oldest islands are the most distant from the hot spot and also the smallest as they have experienced the longest period of erosion. The Hawaiian Islands are hot-spot islands on the Pacific Plate with Hawai’i still over the hot spot and continuing to grow; distantly in the northwest, the French Frigate Shoals are sinking below sea level. The Galápagos Islands formed from a hotspot on the Nazca Plate. Other islands and island arcs form along the convergent zones. Intense interactions between subducting plates and the mantle often result in strings of volcanoes beside the abyssal trenches. The Mariana Archipelago was created in this manner. Subduction zones and rises shift. These geological changes have occurred regularly within the Southwest Pacific; the Tongan and Fijian islands were created along such convergent zones that are no longer active. The formation of Pacific islands occurred repeatedly from the processes outlined above, although in a much more complex manner that described here. Generally, the islands and arcs that we see today have a relatively brief geological history of no more than 40 million years. During that interval, islands have grown and disappeared, island arcs have rotated changing their positions relative to nearby arcs. The arrival and colonization of these islands by reptiles began soon after plants arrived and established a protective and nourishing cover for animal life. Exactly when the present lineages arrived on each island groups is only beginning to be discovered. The complexity of time and sequence of arrival will vary greatly across the great expanse of the Pacific. We can expect a variety of evolutionary scenarios, such as in the Galápagos where the oldest island date to about four to five million years ago, yet data from molecular genetics indicate that some lineages of Galápagos organisms began diverging from their mainland ancestors eight to ten million years ago. Apparently arriving on a hot spot island that is now only a seamount. The Pacific is bound to the north by the Bering Straits, to its east by the Americas, to the west by the continents of Asia, Australia, and the islands on the platform between them, and to the south merges without a surface demarcation into the Antarctic Ocean. This enormous area encompasses numerous nations and island groups containing an estimate of over 24,000 islands. What is and is not part of the Pacific is variously delimited, particularly in the western Pacific. In this area, some authorities have the Pacific and the Indian Oceans abutting on the western edge of the Lesser and Greater Sunda Islands. Other authorities set the western edge of the Pacific abutting the eastern edge of this Sundan platform. A consensus viewpoint accepts the landmasses of Japan, Taiwan, Philippines, New Guinea and eastern Australia, which face the open waters of the Pacific, as that Ocean’s western edge. A broad array of regions, islands, island groups, and nations are encompassed within the Pacific. The simplest grouping to delimit is continental and oceanic islands. Continental islands are ones that have had a subaerial (above water or sea level) connection to a continental landmass. Continental islands lie on the shallower portions of the continental shelf and, in the Pacific, are largely in the western Pacific, because in the eastern Pacific, the shelf is nearly nonexistent and the continental slope of the Americas is extremely steep. Only a few islands lie on this narrow shelf and very close to the American mainland and include the Mexican Tres Marías, California Channel Islands, Queen Charlotee Islands, and the Aleutian Islands. In contrast, the western Pacific Rim islands of Japan, Ryukyus, Taiwan, Philippines, New Guinea, and the Great Barrier Reef islands are continental islands. Some additional regional terms apply largely to oceanic islands. The most obvious one is Oceania. A standard definition of Oceania includes Australia, Papua New Guinea, Solomon Islands, New Caledonia, and New Zealand and the oceanic islands of Polynesia, Micronesia, and Melanesia. This definition of Oceania excludes the Philippine Islands, Japan, eastern Pacific islands (e.g., Galápagos Islands, Clipperton Island), and even the Hawaiian Islands. My preferred usage stresses the oceanic part of Oceania and includes all the islands of Micronesia and Polynesia, and the oceanic part of Melanesia westward into the eastern Solomon Islands. The Australopapuan landmass is continental. New Caledonia and New Zealand are excluded because they are fragments of the supercontinent Pangea. Melanesia, Micronesia, and Polynesia are ethnographic regions defined by the cultures and origins of their human inhabitants. They are well established geographic terms and useful ones. Melanesia is New Guinea and the groups of islands west of it to Fiji. Micronesia lies north of the equator and contains the widely scattered island from the Palau-Marianas axis to the International Dateline. Polynesia covers a vast area of the Central Pacific east of the International dateline from the Hawaiian Island southward to Rapa Nui (Easter Island). A westward tongue of Polynesia extends diagonally across the Dateline from Tonga to Nauru. Melanesia was the first area settled with people arriving in New Guinea at least by 40,000 BCE. These people, who became the Papuans, were largely hunters and gathers, dependent upon the plants and animals of the forest and nearshore marine environments. They were able to cross narrow water gaps with crude canoes and rafts. Presumably they only attempted a crossing when they were able to see the land mass of their destination. The multiplicity of Papuan languages attests to multiple invasions of New Guinea by peoples of many different cultures and at different times. A diaspora of people from Taiwan and adjacent mainland China began about 3000 BCE. These people, now known as Austronesians, are the people source for the colonization of Oceania. Austronesians were horticulturalists. They carried domesticated plants (e.g., yams, taro) and animals (e.g., pigs, dogs, chickens) in their settlement of new lands. Their double-rigger canoes allowed the transport of more people and their cargo, and permitted travel to more distant lands that were beyond their sight-horizon. The latter ability suggests the possession of elementary navigation skills and the identification of suitable settlement sites by previous exploration. The Austronesian spread southward into the Philippines, which they settled, displacing the earlier arriving Nigritos populations. Their dispersal continued with groups moving westward into the Sunda islands, southward to northern New Guinea and the Bismarck Archipelago and whence eastward into southern Oceania, and eastward into the Palau and Mariana Archipelagos, eventually populating most of western Micronesia. The Austronesians moving along New Guinea were coastal inhabitants, mostly living in stilted villages over water. They certainly interacted with the Papuan populations, introducing the latter to their domesticated crops and animals, tools, and ceramics. This Austronesian culture became known as the Lapita. The Lapita continued their eastward dispersal reaching easternmost Solomon Islands by ~1300 BCE, Fiji by ~1100 BCE, and the Tongan and Samoan islands by ~900 BCE. Dispersal paused although interchange among the peoples of these two latter island groups continued and slowly a new culture evolved, the Polynesian culture. Presumably in the middle of the first millennium AD, a major dispersal phase began anew and resulted in the peopling of the remainder of Oceania. This dispersal had the capacity to move large numbers of individuals (40 to 60) and their cargo in large double-hulled canoes. These canoes were a major development of the proto-Polynesian culture. The Cook Islands, Marquesas and Society Islands, and Hawaiian Islands were settled by 800 AD. New Zealand was the last major island reached by the Polynesians and settled in the 1200s AD. Plants and animals dispersed throughout the Pacific long before humans arrived. Plants, then animals shortly thereafter, arrived soon after land arose above the sea. Biological communities that developed over many millennia were drastically disrupted, their component species decimated, and many driven extinct with arrival of the Austronesians. Present day island floras and faunas are vastly different from the prehuman ones, and in many instances, the floras and faunas are dominated by alien species, whose prehistoric presence has made them appear as natives. 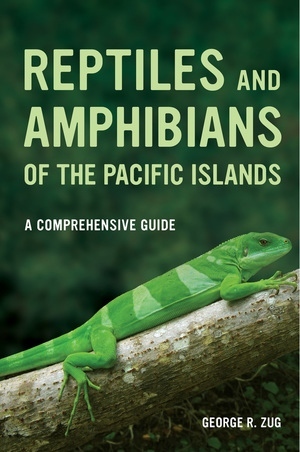 This guide addresses only the reptiles and amphibians inhabiting the oceanic Pacific islands today. The origin and dispersal of the Pacific herpetofauna are not addressed. The Pacific is not only the world’s largest body of water; its vast expanse also includes an extraordinary number and diversity of oceanic islands, from Palau and the Marianas east of the Philippines to Cocos Island and the Galápagos west of the Americas. The isolation of these islands and the extreme distances between them long prevented scientists from studying their floras and faunas in a comparative context. But now George R. Zug, one of the world's foremost experts on the diverse reptiles and amphibians of the Pacific Basin, offers the first such systematic overview in more than half a century. Reptiles and Amphibians of the Pacific Islands is a compendium of frogs, lizards, snakes, and turtles living on these lands and in the adjacent waters of the oceanic islands in the tropical Pacific. George R. Zug is an emeritus research scientist of reptiles and amphibians at the National Museum of Natural History, Smithsonian Institution. 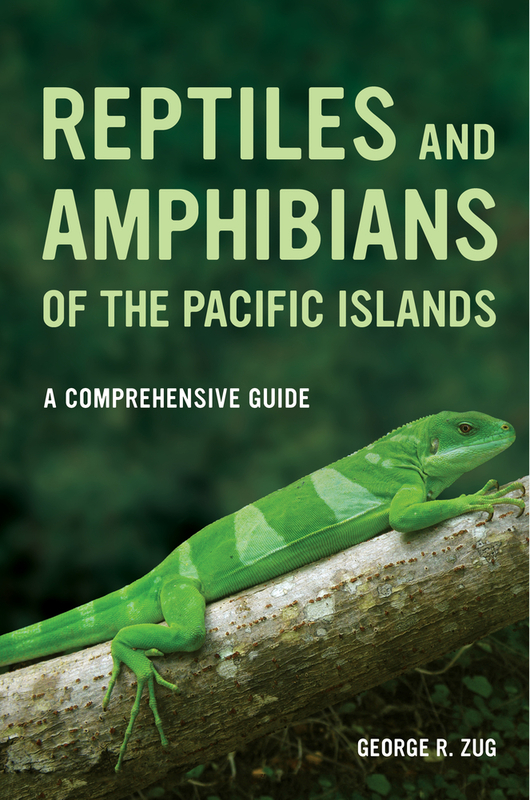 "This work will be a standard reference for the islands of the Pacific for any herpetologist." "This book fills a longstanding gap in knowledge. It presents a wealth of unpublished and primary data in a synthetic way that will provide a better understanding of Pacific Basin biodiversity."